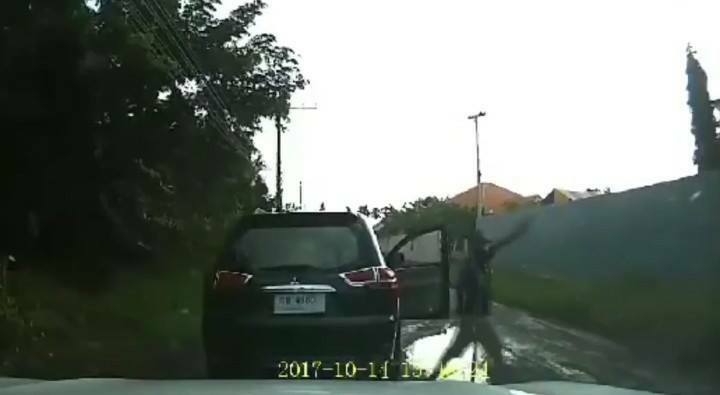 Dash cam footage shows the moment an angry driver in Khon Kaen pulls a gun out of his vehicle and shoots in the direction of a motorcyclist. The footage which was uploaded to the U-Share Facebook group this week shows a black Mitsubishi Pajero Sport in a near miss with a motorbike which swerved suddenly to avoid a pothole. The driver of the Mitsubishi then brings the vehicle to a sudden stop where he can he seen getting out of the car armed with a handgun. He then fires a shot towards the motorcyclist before driving off. The clip was uploaded to Facebook on Tuesday and has since been shared more than 7,000 times. It is not known if police are investigating the incident.